Believe it or not the mad men (and women) of Islamic State have an evil handbook on how best to terrorise and slaughter their enemies ( pretty much everyone on a planet earth then ) and a strategy for the creation of a new Islamic Sate , otherwise known as the caliphate. It is a terror manual that describe in gruesome detail how to bring about the caliphate through the use of extreme violence and brutality and Islamic State have followed its twisted instructions with brutal attention to details and unspeakable acts of inhumanity. This dark jihadist instruction manual that first appeared in 2004 is called The Management of Savagery and offers a template for terrorism and defeat of all infidels. The author of the book was one Abu Bakr Naji , an Egyptian , who was thought to have been an important al-Qaeda strategist , possible evens its one-time head of external affairs. Thankfully Karma caught up with this scumbag and Naji was to succumb to a rather hi-tech piece of savagery management himself – when a US drone obliterated the car he was travelling in and sent him straight to the eternal flames hell. Management of Savagery: The Most Critical Stage Through Which the Islamic Nation Will Pass (Arabic: إدارة التوحش: أخطر مرحلة ستمر بها الأمة‎‎, Idārat at-Tawaḥḥuš: Akhṭar marḥalah satamurru bihā l ‘ummah), also translated as Administration of Savagery, is a book by the Islamist strategist Abu Bakr Naji, published on the Internet in 2004. It aimed to provide a strategy for al-Qaeda and other extremists whereby they could create a new Islamic caliphate. Management of Savagery discusses the need to create and manage nationalist and religious resentment and violence in order to create long-term propaganda opportunities for jihadist groups. Notably, Naji discusses the value of provoking military responses from superpowers in order to recruit and train guerilla fighters and to create martyrs. Naji suggests that a long-lasting strategy of attrition will reveal fundamental weaknesses in the ability of superpowers to defeat committed jihadists. Management of Savagery argues that carrying out a campaign of constant violent attacks (vexation operations) in Muslim states will eventually exhaust their ability and will to enforce their authority, and that as the writ of the state withers away, chaos—or “savagery”—will ensue. “One who previously engaged in jihad knows that it is naught but violence, crudeness, terrorism, frightening [others] and massacring — I am talking about jihad and fighting, not about Islam and one should not confuse them”. Jihadists can take advantage of this savagery to win popular support, or at least acquiescence, by implementing security, providing social services, and imposing Sharia. As these territories increase, they can become the nucleus of a new caliphate. Naji nominated Jordan, Saudi Arabia, Yemen, North Africa, Nigeria and Pakistan as potential targets, due to their geography, weak military presence in remote areas, existing jihadist presence, and easy accessibility of weapons. Naji professes to have been inspired by Ibn Taymiyya, the influential 14th-century Islamic scholar and theologian. The word in the title توحش tawaḥḥuš has been translated as “savagery” or “barbarism”. As it is a form V verbal noun derived from the root وحش waḥš “wild animal”, it has also accordingly been translated “beastliness”. A number of media outlets have compared the attempts by the Islamic State of Iraq and the Levant to establish territorial control in Iraq and Syria with the strategy outlined in Management of Savagery. The first issue of the Islamic State’s online magazine, Dabiq, contained discussion of guerrilla warfare and tactics that closely resembled the writings and terminology used in Management of Savagery, although the book was not mentioned directly. Journalist Hassan Hassan, writing in The Guardian, reported an ISIL-affiliated cleric as saying that Management of Savagery is widely read among the group’s commanders and some of its rank-and-file fighters. It was also mentioned by another member of ISIL in a list of books and ideologues that influence the group. 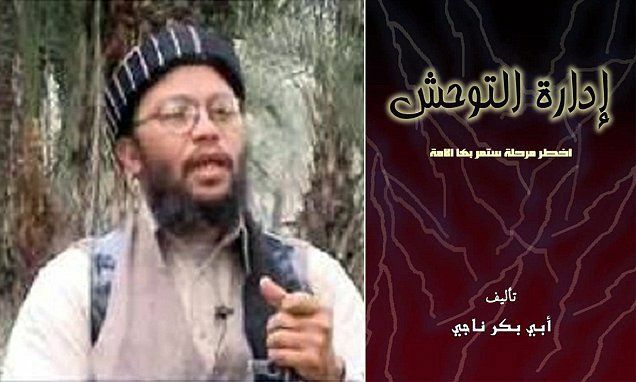 Al-Qaeda in the Arabian Peninsula has been described by The Jamestown Foundation as following Naji’s guidelines in Yemen, while the book has been mentioned positively in interviews with members of Somalia‘s Al-Shabaab. Scholars Brian A. Jackson and Bryce Loidolt argue that Management of Savagery and Mustafa Setmariam Nasar‘s The Global Islamic Resistance Call led al-Qaeda to innovate and shift practices.